The increase in industries leads to high discharge of effluents, which in turn pollutes the environment critically. Algal technology is a very efficient method to treat this effluent by using bioremediation process. Algae can be cultivated under certain conditions of temperature, light and sufficient nutrients to produce value added products. Many research works were undertaken to increase the efficiency of the production rate in both indoor and outdoor cultivation systems by designing special Photo-Bio Reactors (PBR's) to increase the rate of photosynthesis. Duration and intensity of light have more impact on the growth and photo synthesis of micro algae. Micro algae have excellent potential for industrial applications to treat effluent. Micro algae need a light/dark regime for productive photosynthesis. The LED (Light Emitting Diode) has the potential to stimulate the growth rate of algae. 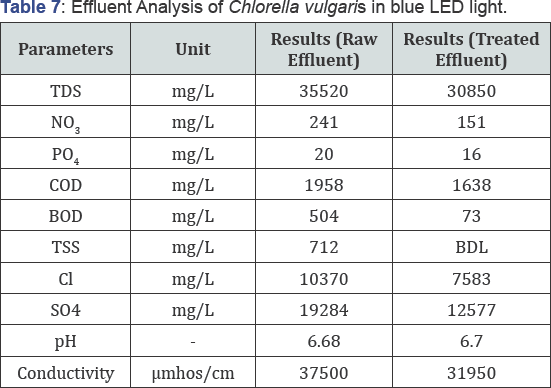 Experiments conducted in the current research work showed that, the growth rate of Chlorella vulgaris (algal species of our interest) is increased by 5.31% (RED LED), 3.72% (BLUE LED) and 6.31% (WHITE LED) at varying effluent concentrations respectively in laboratory conditions. Also the study clearly shows that the Total Dissolved Solids (TDS) is reduced significantly by 15%, COD by 23.7%, BOD by 93% and Total Suspended Solids (TSS) by 99.8% under Blue LED and under White LED, TDS is reduced by 20%, COD by 27.3%, BOD by 97%, and TSS by 99.99%. The result clearly proves that the biodegradation rate is significantly increased and physiochemical parameters varied for different wavelengths of Blue and White LED lights. Developments in industrialization have led to the increase pollution mainly caused due to the disposal of liquid and solid wastes in to the environment. Dairy, Tannery, Textile, Pharmaceuticals and Paper industries produce goods necessary for the sustenance of life and are the primary sources of pollution. Due to ever increasing population and urbanization problems associated with pollutants are likely to increase . Water pollution has significantly affected the highly populated countries and people living in these countries have been suffering from serious health ailments . Pollution control has been one of the important areas requiring immediate focus and intervention through scientific research. It is of common interest to find out suitable remedies for treating wastewater and to have sustainable development [2,3]. Main causes for surface and groundwater contamination are the industrial discharges . These effluents typically contain high concentrations of organic and inorganic chemicals such as hydrocarbon solvents, heavy metals, pesticides, dyes and so on. The control of organic pollutants in wastewater is a very important measure in environmental protection . Dye industry tops the charts by releasing 2-20% of its effluents in environmental components. Synthetic dye usage has increased in the textile and dyeing industries because of their ease and cost-effectiveness in synthesis, firmness, high stability to light, temperature and microbial attack. 10-25% of the total world production of dyes is lost during dyeing process and is released in the form of textile effluents [4,5]. The most common textile processing unit consists of desizing, scouring, bleaching, mercerizing and dying process from which effluent waste is discharged . 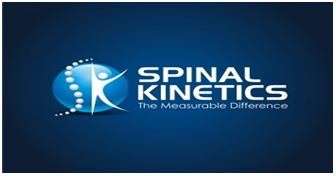 This results in the increase of BOD, COD, TSS and alteration of pH. The textile industry consumes large amounts of potable and industrial water as processing water (90-94%) and relatively low percentage as cooling water (6-10%) . Therefore, treatment of these industrial effluents is necessary prior to their final discharge to the environment. The textile manufacturing process is characterized by the high consumption of resources like water, fuel and a variety of chemicals in a long process sequence that generates a significant amount of waste . The common practices of low process efficiency result in substantial wastage of resources and a severe damage to the environment . The main environmental problems associated with textile industry are typically those associated with water body pollution caused by the discharge of untreated effluents . The treatment of wastewater requires large amount of materials are to be supplemented. Nutrient rich wastewater instead of discharging into environment is supplemented for the growth of algae in the wastewater treatment . Thus nutrients can be reused and wastewater can be treated and thus reducing the negative impacts . The effective method to treat effluent is bioremediation process using algal technology. As the algae takes up N and P, the wastewater can be treated with algae . Green growth is a various gathering of oceanic creatures that can lead photosynthesis. Certain algae are familiar to most people; for instance, seaweeds (such as kelp or phytoplankton), pond scum or the algal blooms in lakes. The expression «green growth» covers a wide range of living beings fit for delivering oxygen through photosynthesis (the way toward reaping light vitality from the sun to create sugars) . They can exist as single, microscopic cells and they can be macroscopic and multi-cellular that lives in colonies or take on a leafy appearance as in the case of seaweeds such as giant kelp. Phytoplankton is between 0.2 to 2 micrometers in diameter, while the fronds of giant kelp are as large as 60 meters in length. Algae are found in a range of aquatic habitats, both freshwater and salt water [8-11]. Recent studies on microalgae have a great deal of attraction as they have a potential of producing bio-fuel depending on the species and cultivation conditions . They can also spontaneously convert CO2 and nutrients into biomass in the presence of light at much higher rates than conventional oil producing crops . Influence of algae to our environment and well-being is the generation of oxygen through photosynthesis. Algae are indispensable because they produce about half the oxygen in Earth's atmosphere. Algal biofuels are a promising replacement for fossil fuels. All algae have the ability to produce energy- rich oils and several microalgae species naturally accumulate high levels of oil in their dry mass . Moreover, algae are found in diverse habitats and can reproduce quickly . They also efficiently use carbon dioxide. Green growth help to keep environmental carbon dioxide levels stable by putting away (the gas) in natural materials that incorporate oil stores and inorganic carbonate rocks. Green algae, diatoms and cyano-bacterium are just some of the microalgae species that are considered good candidates for the production of bio-fuel . Green growth cost more per unit mass than other second-era bio-fuel trims Green growth are developing to be a standout amongst the most encouraging long haul, supportable wellsprings of biomass and oils for fuel, nourishment, sustain, and other co-items. What makes them so attractive are the large number and wide variety of benefits associated with how and where they grow . Green growth can twofold their numbers like clockwork, can be gathered day by day, and can possibly create a volume of biomass and bio-fuel commonly more prominent than that of our most beneficial harvests. Microalgae can be developed to have a high protein and oil content, for instance, which can be utilized to deliver either bio-fuels or creature sustains, or both. What’s more, microalgae biomass, which is rich in micronutrients, is as of now utilized for dietary supplements to propel human wellbeing . Algae thrive in nutrient-rich waters like municipal waste waters (sewage), animal wastes and some industrial effluents, at the same time purifying these wastes while producing a biomass suitable for bio-fuels production [3,5]. After oil extraction, the staying algal biomass can be dried and «pelletized» and utilized as fuel that is singed in mechanical boilers and other power era sources . Conventionally micro algae are grown in Photo Bio Reactor (PBR) with the help of sunlight and white light. But apart from this many lights have more impact on the growth of algae. The growth of algae is directly proportional to intensity of light [12,14]. Light-Emitting Diode (LED) array, which can be supply only the wavelengths of light that will be most useful for algae growth. Green algae contain chlorophyll A and B in the ratio (3 chlorophyll A: 1 chlorophyll B). Chlorophyll A has two absorption peaks, the first around 430nm (blue/violet color) and the second at 660nm (deep red). Chlorophyll B absorption peaks are 460nm (blue) and 630nm (red) [5,9]. In more mature cultures, red and blue light is absorbed by the algae cells closest to the LEDs source . The sample (effluent) was collected from the dye industry, Tirupur city-Tamilnadu-India and physico-chemical parameters of the dye effluent were analyzed before the treatment process. Algae species were cultured in Algae Culture Lab at the Department of Chemical Engineering at Sri Venkateswara College of Engineering, Sriperumbudur-Tamilnadu-India. Studies on growth pattern of algae species (10mL, 100mL) were carried out. Algae cultures were procured from the University of Madras, India and inoculated in 10ml boiler tubes kept at slanted positions in order to provide maximum and constant light intensity of 24 hours and 1800lux (measured via lux meter), to the micro-algae . Cell count was taken at regular interval and the algae which adapted well and grew fast was selected for further process . Hemo-cytometer line method is used to estimate ell count of the micro algal culture. The no. of cells present in the matrix present on the Hemo-cytometer was observed under microscope with 10 X and 40 X resolutions and the no. of cells present was noted [10,12]. It is shown that from Table 1, Bold Basal Medium is used for fresh water algae and has micro and macro nutrients for the growth of algae . A 50L capacity cane of dye effluent was collected from a textile industry from Tirupur city, Tamilnadu-India. To determine the standard levels to proceed further treatment process, 1L of the effluent was sent for physicochemical analysis. 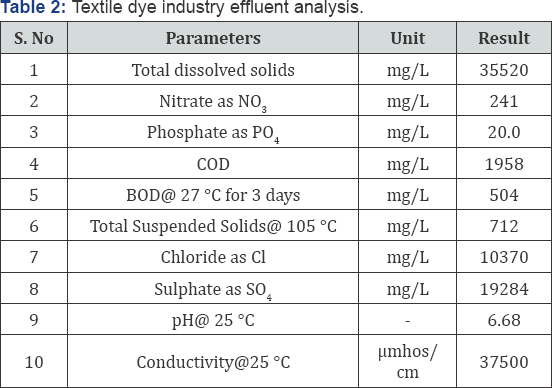 It is shown that from Table 2, The Total Dissolved Solids (TDS), Chemical Oxygen Demand (COD), pH, Chlorine, Sulphate and Conductivity of Dye Effluent which was collected from a textile industry in Coimbatore is more and is needed to be reduced from the dye effluent by using algal technology. The mother culture should be maintained to carry out the process. So, 9ml of BBM medium was taken and 1ml of the centrifuged algae culture was inoculated in it. The growth studies were monitored at regular intervals. Then, this 10ml of the culture was centrifuged and inoculated in 100ml of medium and growth studies were monitored. Cell count was taken using Hemo-cytometer and number of cell was calculated using growth rate formula. Three LED light (Red, Blue, and White) setup was designed and fabricated. The light arrangement was kept in a position to get 1800lux of light intensity. The prepared four 10ml algae culture was kept in three LED light setup and one in normal tube light for comparison. Cell count was taken at regular intervals till the declining phase. It is shown that from Table 3, the cell count and the growth rate of Chlorella vulgaris in normal tube light. The cell count was stopped when it reached the decline phase. 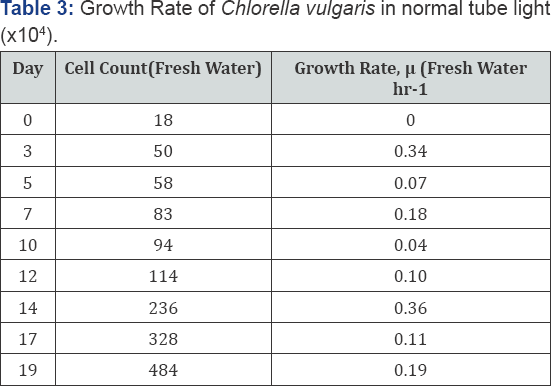 It is shown that from Table 4, the cell count and the cell growth rate of Chlorella vulgaris in fresh water and effluent with Red LED Light, the maximum growth rate was found at day 7 for fresh water and day 10 for effluent. The cell count was stopped when it reached the decline phase. It is shown that from Table 5, the cell count and the growth rate of Chlorella vulgaris in fresh water and effluent with Blue LED Light. The cell count was stopped when it reached the decline phase. It is shown that from Table 6, the cell count and the growth rate of Chlorella vulgaris in fresh water and effluent with White LED Light. The cell count was stopped when it reached the decline phase. Figure 1 shows the LED light setup which is used to stimulate the growth of algae by making it possible to achieve non-scattered required light intensity. Figure 2 & 3 show the impact of LED light on the growth of algae. The effluent color changes from light bluish-green to green color, which confirms the growth of green algae in the effluent. It is shown that from Table 7, the degradation of various chemical substituent's present in effluent by algal treatment using Blue LED Light. 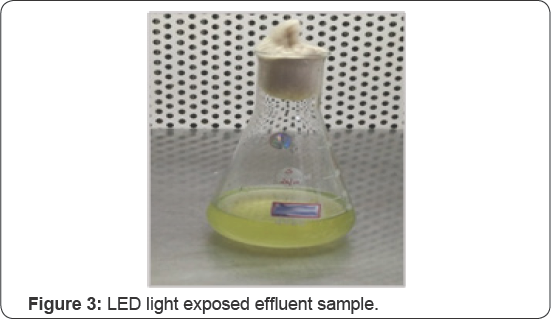 It is shown that from Table 8, the degradation of various chemical substituent's present in effluent by algal treatment using White LED Light. The most essential parameters directing algal development are supplemented amount and quality, light, pH, turbulence, saltiness and temperature. The most ideal parameters and also the endured ranges are species particular. Groupings of cells in phytoplankton societies are by and large higher than those found in nature. Similarly as with all plants, smaller scale green growth photosynthesizes, i.e. they absorb inorganic carbon for change into natural issue. Light is the wellspring of vitality which drives this response and in such manner power, otherworldly quality and photoperiod should be considered. Light force assumes a vital part; however the necessities fluctuate enormously with the way of life profundity and the thickness of the algal culture: at higher profundities and cell fixations the light power must be expanded to enter through the way of life, a light force of 1800lux was us utilized for this culture. LED’s in Blue and the Red light spectrum was used as these are the most active portions of the light spectrum for photosynthesis. The duration of artificial illumination was minimum 12h of light per day. The pH range for Chlorella vulgaris culture was between 8 and 9. Blending was important to counteract sedimentation of the green growth, to guarantee that all cells of the populace are similarly presented to the light and supplements, to keep away from warm stratification and to enhance gas trade between the way of life medium and the air. The latter is of primary importance as the air contains the carbon source for photosynthesis in the form of carbon dioxide. The temperature for the culture growth was between 25 and 30 °C. It is shown that from Table 2, The Total Dissolved Solids (TDS), Chemical Oxygen Demand (COD), pH, Chlorine, Sulphate and Conductivity of Dye Effluent which was collected from a textile industry in Coimbatore is more and is needed to be reduced from the dye effluent by using algal technology. Table 3 represents the cell count and the growth rate of Chlorella vulgaris in normal tube Light. The cell count was stopped when it reached the decline phase. 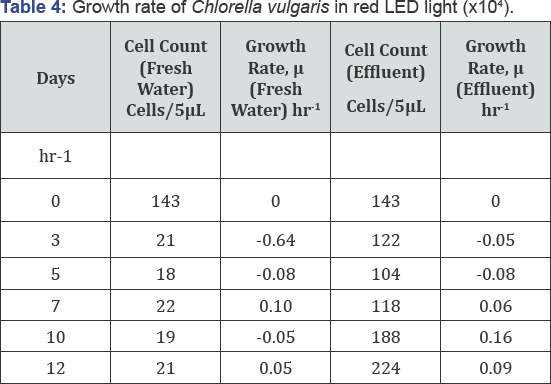 Table 4 represents the cell count and the growth rate of Chlorella vulgaris in fresh water and effluent with Red LED Light, the maximum growth rate was found at day 7 for fresh water and day 10 for effluent. The cell count was stopped when it reached the decline phase. 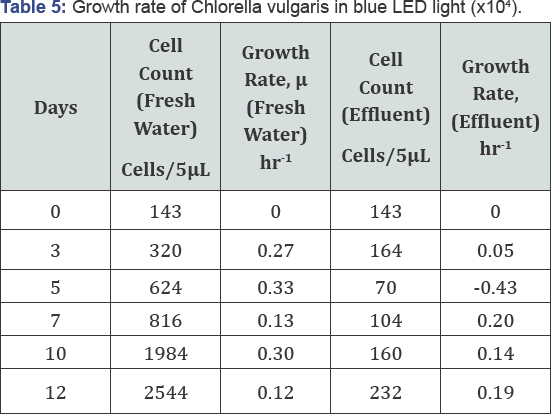 Table 5 represents the cell count and the growth rate of Chlorella vulgaris in fresh water and effluent with Blue LED Light. The cell count was stopped when it reached the decline phase. 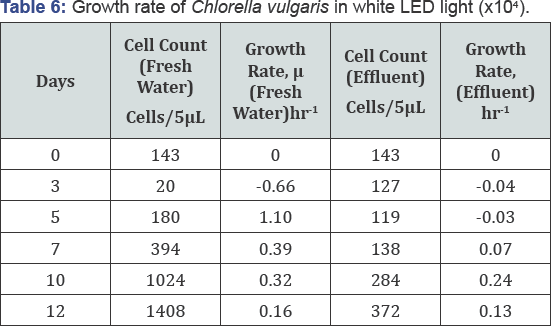 Table 6 represents the cell count and the growth rate of Chlorella vulgaris in fresh water and effluent with White LED Light. The cell count was stopped when it reached the decline phase. Table 7 shows the degradation of various chemical substituent's present in effluent by algal treatment using Blue LED light. 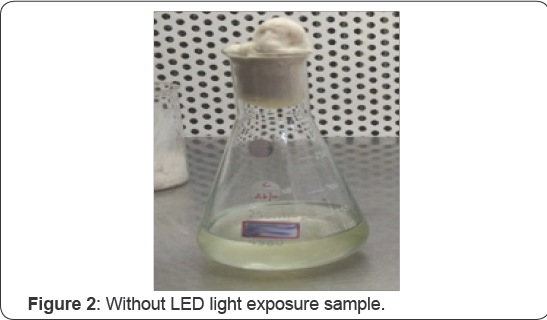 Table 8 shows the degradation of various chemical substituent’s present in effluent by algal treatment using White LED light. The experiment was carried out successfully and the results obtained were appreciable. But comparatively the LED light exposure has played a crucial role in giving a qualitative effluent when compared to normal tube light. This experiment which has been carried out at lab scale is the first step to reach greater heights by implementing this technology at pilot scale. The result acquired from the experiments shows that the growth of algae can be stimulated by the intensities of various lights sources. LED's critically conserves energy as it requires only less electric energy when compared with Fluorescent lights to produce the same light intensity. It does not produce undesirable wavelengths of light which results in more energy consumption. LED lights play a vital role in production of biomass in less time than the time required by normal tube lights. 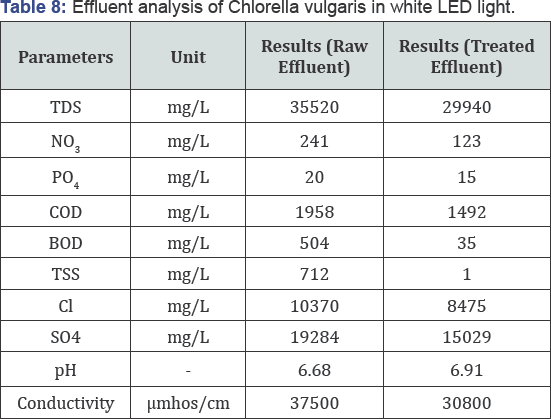 Experiments conducted in the current research showed that, the growth rate of Chlorella vulgaris increased by 5.31%, 3.72%, and 6.31% respectively in presence of LED’s (Red, Blue and White). Also the study proved that the productivity of algae increased especially in red, blue and white LED light when compared with normal tube lights. The study also clearly proves that the Total Dissolved Solids (TDS) is reduced significantly by 15%, COD by 23.7%, BOD by 93% and Total Suspended Solids (TSS) by 99.8% under Blue LED and under White LED, TDS is reduced by 20%, COD by 27.3%, BOD by 97%, and TSS by 99.99%. The result clearly shows that the biodegradation rate is significantly increased and physiochemical parameters varied for different wavelengths of Blue and White LED lights. Thus LED lights paves way for many research regions due to its significant properties and dynamic ability to sustain in all areas. Authors would like to extend their gratitude for the management of Sri Venkateswara College of Engineering, Sriperumbudur-India for extending their full support in carrying out this project. Sudhakar K, Premalatha M (2012) Micro-algal technology for sustainable energy production: state of the art. Journal of Sustainable Energy & Environment, pp. 59-62. Larsdotter K (2006) Wastewater treatment with microalgae. Vatten 62: 31-38. Krishnan A, Neera AL (2013) Waste water treatment by algae. IJIRSET 2(1): 1-8. Abishek MP (2016) Algae oil: a sustainable renewable fuel of future. Biotechnol Res Int 2014(2014): 1-8. Eltringham D (2013) LED Technology for Energy Efficient Microalgae Growth. AIChE. Pandey VK (2016) Carbon Science and Technology, ASI, pp. 86-93. Meena P, Peter G, Lucy A, Michael C, Christian-Smith J, et al. (2010) Clearing the Waters: A focus on water quality solutions, ISBN: 978-92807-3074-6. Rather ZR (2009) Successive Botany. 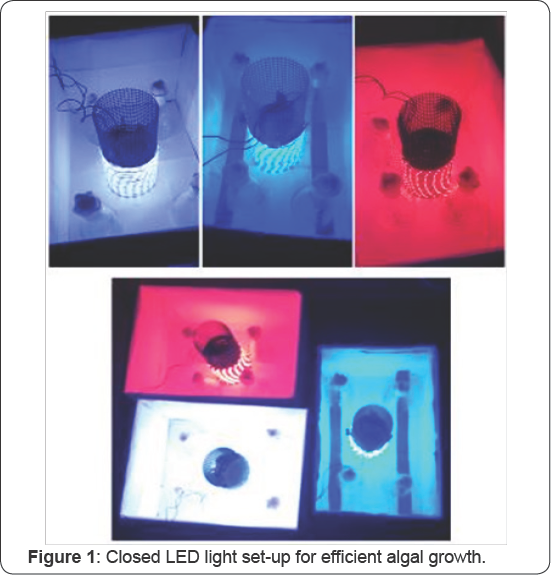 Anna J, Christian S, Rosa Rosello S, Clemens P (2012) Advanced photobioreactor LED illumination system: Scale-down approach to study microalgal growth kinetics. Eng Life Sci 12(3): 621-630. Arminder K, Siddharth V, Sumit R, Ankit B, Jharna G, et al. (2010) Physico-chemical analysis of the industrial effluents and their impact on the soil microflora, ISEIS, pp. 595-599. 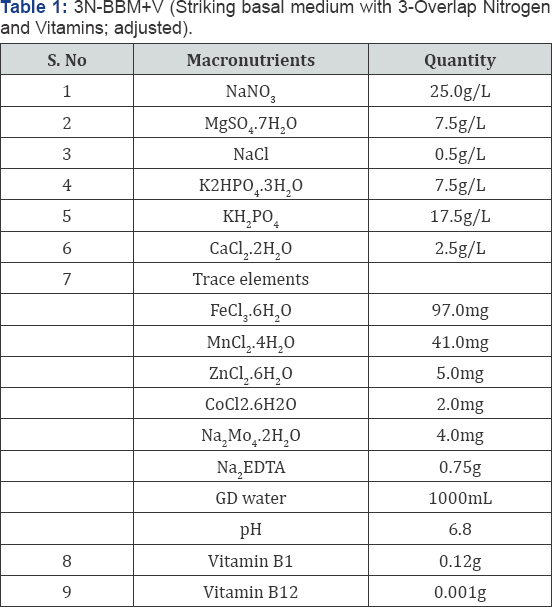 Feng Y, Li C, Zhang D (2011) Lipid production of Chlorella vulgaris cultured in artificial waste water medium, Bioresource Technology 102(2011): 101-105. Al-Qasmi M, Raut N, Talebi S, Al-Rajhi S, Al-Barwani T (2012) A Review of Effect of Light on Microalgae Growth. WCE 1: 1-3. David JT (2008) Food vs. fuel: diversion of crops could cause more hunger. Environ Health Perspect 116(6): A254-A257. Posten C (2009) Design principles of photo-bioreactors for cultivation of microalgae. Eng Life Sci 9(3): 165-177. Xin Li (2010) Effect of LED's red/blue light on the growth characteristic and lipid production of Chlorella Vulgaris LX1. Huan Jing Ke Xue 31(2): 513-519.